FROM Brooklyn in north Sydney to its namesake in New York City. Ben McCarthy - who has Asperger's syndrome - is the state's youngest international award winning filmmaker at only 12 years old. 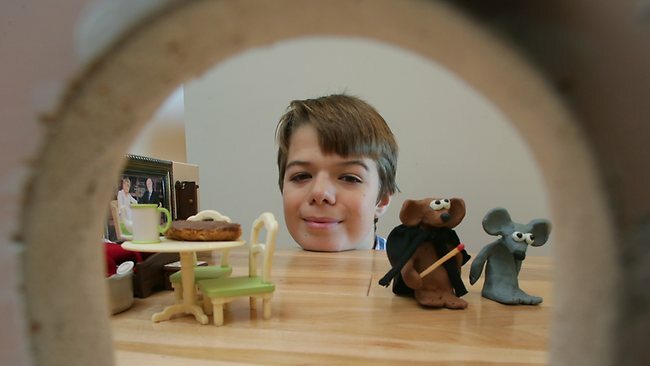 Inspired by the famous Wallace and Gromit series, the pint-sized film director took out the Trop Jr film festival and a gong at The Art of Brooklyn Film Festival in New York with his claymation creation. Bumper, which took six-months to finish, was based on Ben's own life experience growing up in Sydney's most northern suburb on the Hawkesbury River. "We live in Brooklyn and near there is ponds with tadpoles and frogs and I always wanted to make a movie with tadpoles and frogs," he said. Ben's mother Leanne said watching Ben create Bumper was "like pulling teeth" because of the effort he put into claymation and using his old computer at the time, but he hung in there. "Bumper really reflected his situation in life. His brother was successful in sport and Ben was on the creative side like Bumper," Ms McCarthy said. She and her husband Graeme described their son's Asperger's diagnosis as "a gift". "He sees it as a positive, not a negative. I am extremely proud obviously because he has had such an amazing achievement at such a young age." Bumper won best animation at the Brooklyn film festival. Ben said along with winning Trop Jr in February, taking out the international award was "the best moment of my life". "I felt a rush of excitement and adrenaline all at once" Ben said. "When I got the letter saying I won best animation I was happy at first and realised my movies are being noticed." Ben has made other films including Lightbulb and P.O.O.P and is currently working on a project with his brother Josh, 16, to enter in the senior Tropfest competition. Entries for the next Trop Jr, which has a Monster theme, open on August 15.